Toddlers at the Child Care Network, an innovative program hosting centers with quality and affordable early education and child care throughout the country, receive care made to celebrate and embrace exciting developmental milestones. 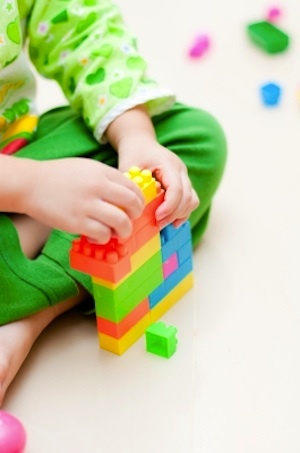 Some developmental milestones toddlers at the Child Care Network will work toward include pointing to objects, experimenting with sounds, starting to explore and play independently and stacking blocks and other toys. The staff at Child Care Network centers uses creative materials and activities to encourage learning and help toddlers work toward these developmental milestones. Teachers work with toddlers at the Child Care Network to help build confidence. By developing finer motor skills, toddlers gain confidence in their own actions, building overall self confidence. Little ones are encouraged to embrace their confidence and use it to explore their surroundings, made safe by the knowledgeable staff and teachers of the Child Care Network. Teachers also work on helping toddlers develop listening and communication skills. By talking through routines and listening carefully to children’s wishes and conversation, little ones’ communication skills grow stronger every day. This also helps develop more complex thinking patterns, leading to a successful academic career in the future. Classrooms are filled with engaging toys and objects to encourage thinking and exploration. Many teachers work to bring in new items, crafts or decorations to keep the environment fresh and open to learning. Toddlers at the Child Care Network are between the ages of 12 and 24 months old. Visit the Child Care Network to learn more.